There was, since the beginning of the Blog Cenário 3D, the idea of publishing a series about iconic or classic chairs. Our intent is sharing a growing volume of content and knowledge for research, consult and reference to professionals of fields such as interior design, architecture, furniture design and design enthusiasts. In this second part we present five more chairs and armchairs of the Iconic Chairs series. We hope you like it. The comments are very welcome. Havia, desde o início do Blog Cenário 3D, a idéia de publicarmos uma série sobre cadeiras icônicas ou clássicas. O nosso intuito é disponibilizar um volume crescente de conteúdo para pesquisa, consulta e referência para os profissionais de áreas como design de interiores, arquitetura, design de produto e entusiastas do design. Nessa segunda parte apresentamos mais cinco cadeiras/poltronas da série Cadeiras e Poltronas Icônicas. Esperamos que vocês gostem. Os comentários são muito bem vindos. Quick facts/Fatos rápidos: Designed in 1928 by one of the great pioneers of modern architecture and furniture design, Le Corbusier, this lounge chair was far beyond its time and still resembles a post modern piece of art. It is permanently displayed at the Modern Museum of Art in New York City. Projetada em 1928 por um dos grandes pioneiros da arquitetura moderna e design de móveis, Le Corbusier, essa chaise longue era muito além do seu tempo e ainda lembra uma peça de arte pós moderna. Ela é permanentemente exposta no Museu de Arte Moderna de Nova Iorque. Materials/Materiais: The structure is a heavy chrome plated tubular steel frame on black enameled base. The mattress is filled with polyurethane foam and covered with leather. A estrutura é composta de pesados tubos de aço cromados em uma base esmaltada preta. As almofadas são preenchidas com espuma de poliuretano e revestidas com couro. Dimensions: 165cm x 56cm x 73cm. Quick facts/Fatos rápidos: The LC2 Petit Armchair is the mini-me version of the Grand Comfort Chair designed by Le Corbusier in 1928. The difference between the two are that the LC2 is more compact, and the LC3 has down-wrapped cushions that create a softer look and feel. They both possess highly dense seating and a cube shaped body with a cut out for seating that provides maximum comfort. A ploltrona Petit LC2 é a versão mini da “Grand Comfort Chair” projetada por Le Corbusier em 1928. As diferenças entre as duas são: A LC2 é mais compacta e a LC3 tem almofadas que criam um visual mais suave. Ambas possuem assentos de alta densidade e forma cúbica com um corte para o assento que confere o máximo em conforto. Materials/Materiais: Steel frame finished in chrome with leather cover / Estrutura em aço cromado e revestimento em couro. Dimensions: LC2 76cm x 70cm x 68cm; LC3 90cm x 70cm x 70cm. 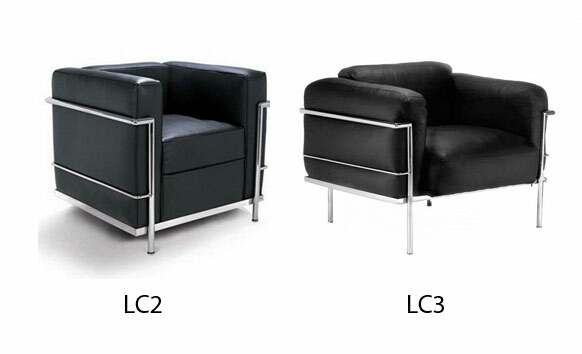 Quick facts/Fatos rápidos: The LC7 swivel chair was designed in 1928 by Le Corbusier and his two collaborators, Charlotte Perriand and Pierre Jeanneret. 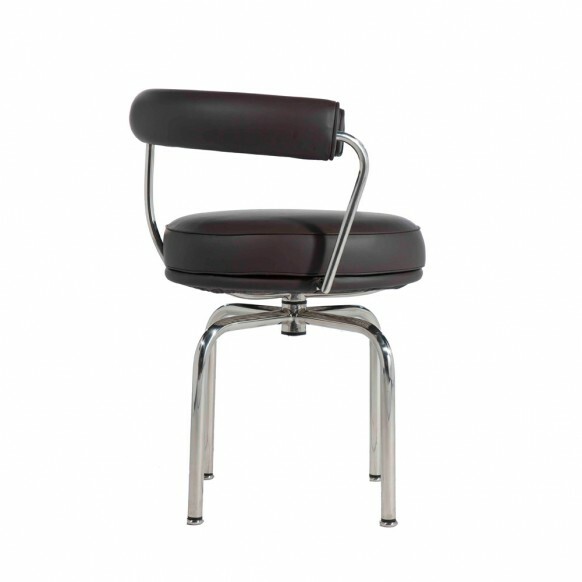 The chair was first presented in 1929 at an exhibition at the Salon d’Automne in Paris, France. It represented a return to a clear and ordered form in design that Le Corbusier advocated as one of the founders of the Purism art movement. A cadeira LC7 foi projetada por Le Corbusier e os seus dois colaboradores, Charlotte Perriand e Pierre Jeanneret. A cadeira foi apresentada em 1929 no “Salon d’Automne” em Paris. Ela representou um retorno a uma forma limpa e ordenada em design que Le Corbusier defendia como um dos fundadores do Purismo. Materials/Materiais: Steel frame finished in chrome and leather / Estrutura de aço cromado e couro. Dimensions: 60cm x 52cm x 52cm. 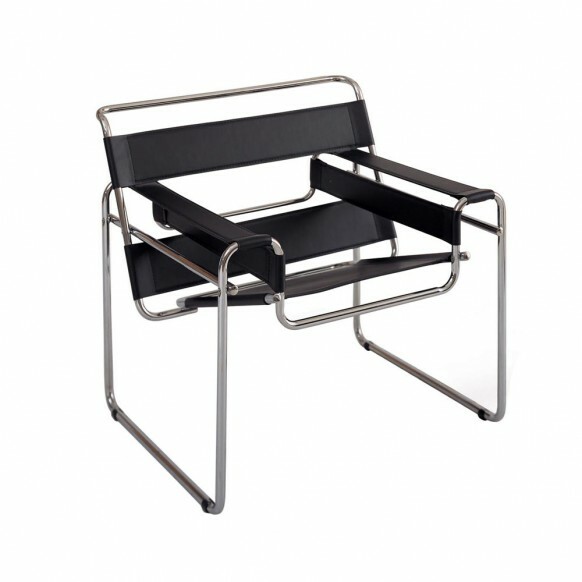 Quick facts/Fatos rápidos: Designed in 1925 by Marcel Breuer, the Wassily chair is artistic, funky and timeless with its lightweight construction and dynamic lines. Also known as the Model B3, the Wassily was revolutionary for the manufacturing methods and innovative use of bent steel tubes and canvas. Projetada em 1925 por Marcel Breuer, a cadeira Wassily é artística e atemporal com a sua construção leve e linhas dinâmicas. Também conhecida como a modelo B3, A Wassily foi revolucionária pelos métodos de produção e pelo uso inovador de aço curvado e tela. Materials/Materiais: Steel tubes finished in chrome and fabric (initially) or leather (currently) / Tubos de aço cromados e tecido (inicialmente) e couro (atualmente). 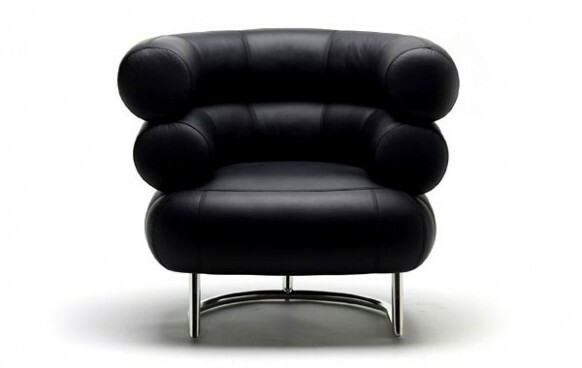 Quick facts/Fatos rápidos: The Bibendum Chair was created in the early 1920’s for a millionaire who commissioned Eileen Gray to design her home from the ground up. A poltrona Bibendum foi criada no início dos anos vinte para um milhonário que contratou Eileen Gray para projetar sua casa a partir do zero. Materials/Materiais: Steel tubes and leather / Tubos de aço cromados e couro. Dimensions: 80cm x 95cm x 73cm. Thanks, Beatrice. Greetings from the team. / Obrigado, Beatrice. Saudações da equipe. Obrigado, Antonio Carlos. Visite-nos mais vezes no blog. Publicamos artigos diariamente sobre arquitetura e design. / Thanks Antonio Carlo. Make sure to visit us more often on the blog. We publish articles about architecture and design on a daily basis. Saudações da equipe. / Greetings from the team.